hello there! First time visiting? Subscribe to get new posts via email. 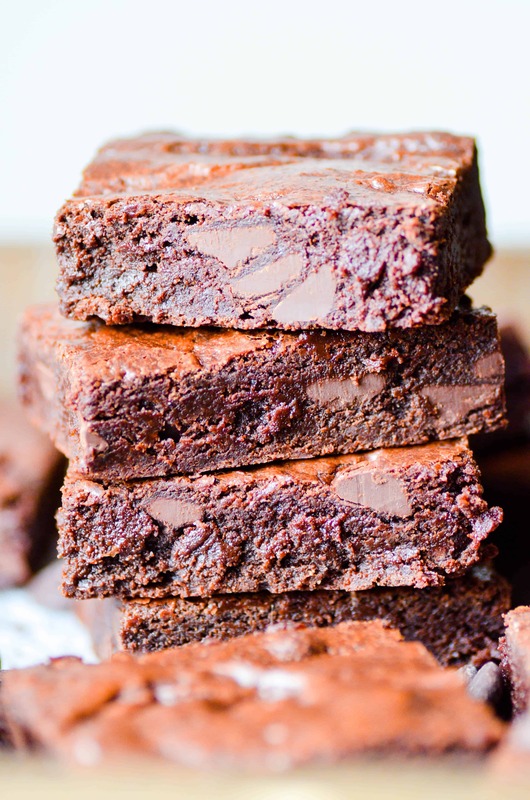 These Browned Butter Brownies are rich and fudgy, the absolutely perfect brownie! 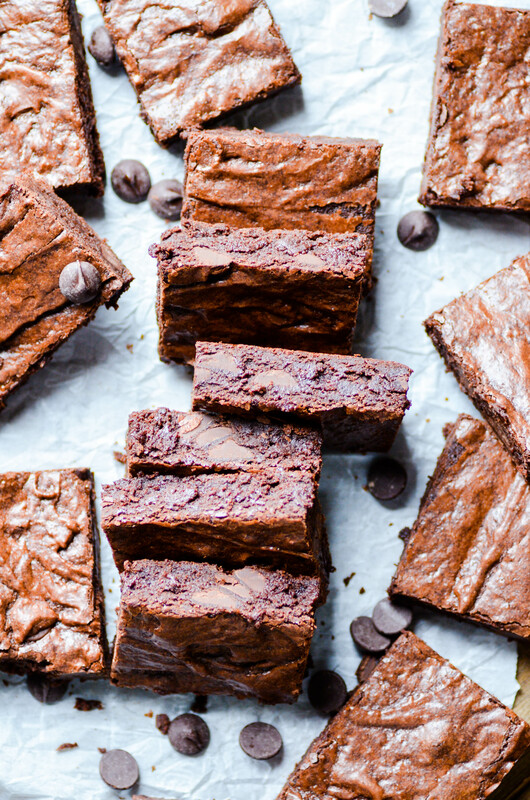 You’ve never had brownies as rich and fudgy as these Browned Butter Brownies! I made this recipe twice back-to-back: once with the browned butter and once simply melting the butter instead of browning it. 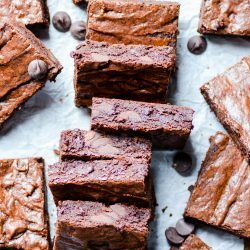 Here’s what I discovered: even though the browned butter brownies don’t have that toffee-like browned butter signature flavor, they are significantly richer and fudgier than the brownies made by only melting the butter using the same recipe. So take the time to brown the butter! A tip on browning butter: pull the butter off the heat when it starts to smell toffee-like. There is a subtle (but distinct!) change in the smell as the butter is cooking, and that’s the time to pull it from the heat. Continue to stir for a few minutes once it’s off the heat, otherwise it can still burn! 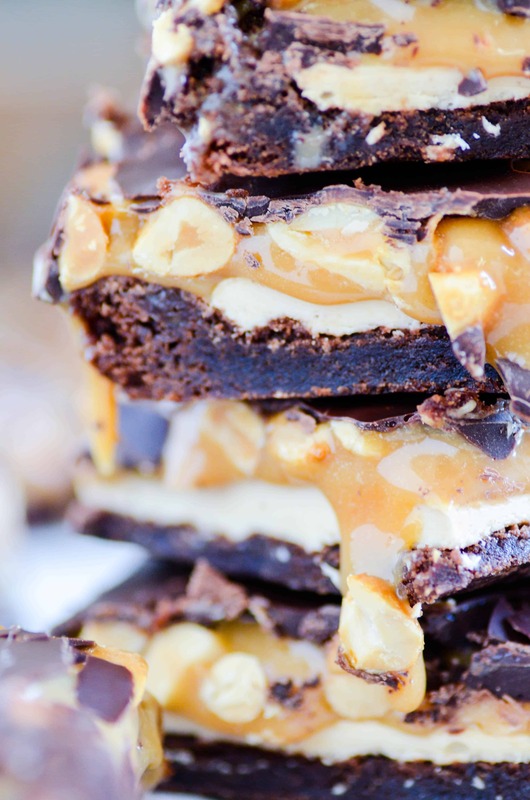 How do you get gorgeous, crackly tops when it comes to brownies? Mix in chocolate chips. Same goes for blondies. I don’t know how it works, but that’s the secret behind all the shiny, crackly goodness! Preheat oven to 350ºF. Prepare a 9x13 baking dish by lining it with foil or parchment and lightly greasing with a nonstick cooking spray. Over medium-high heat, melt the butter. Stir continuously until the aroma changes (should smell toffee-like) and the color shifts to a very light golden brown. Remove from heat and continue to stir for 2-3 minutes more. Whisk together the butter and the sugar in a large mixing bowl. Whisk in the eggs, one at a time. In another bowl, mix or sift together the flour, unsweetened cocoa powder, and salt. Fold the dry ingredients into the butter-sugar mixture until batter forms. Pour the batter into the prepared pan. Bake for 25 minutes or until the edges are pulling away slightly from the pan. Have you made a Something Swanky recipe? Post it on Instagram and tag me @somethingswanky or use the hashtag #somethingswankyrecipes. I’d love to re-post! Be sure to also follow me on Facebook, Pinterest, Twitter, YouTube, and in the Something Swanky Dessert Recipes Facebook group! More Brownies & Blondies I think you’ll love! Ashton is the owner and author of Something Swanky. Although first and foremost a wife and mother, she considers herself an online entrepreneur, freelance writer and photographer, and brand ambassador. Her focus is in food styling, food photography and recipe development. Wow! These look absolutely delicious! Did you add choc chip chunks to the recipe? I live in the middleeast where things are measured in grams…I can figure everything else out except the butter – what is 1 stick of butter? How many grams? Excited to try the recipe! 1 stick is 1/2 cup! So sorry, I will be editing that measurement soon! 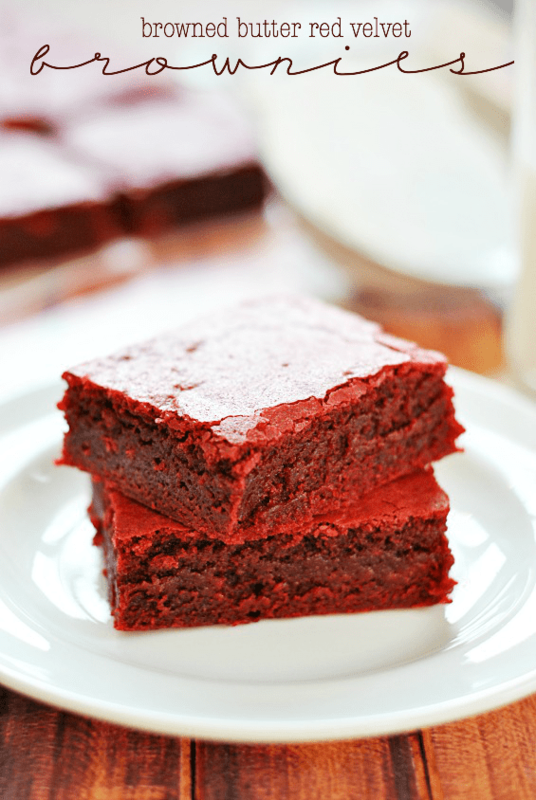 these brownies look unbelievable – but I DO love brown butter in just about anything! These look relish! My husband loves brownies, can’t wait to surprise him with these! I am having such a big love affair with brown butter right now. I must try these. Alright! I’m going to save it! Oh…stop it! These look absolutely incredible and so moist!! Pinning!! No way I could justify using that much butter and sugar with only one cup flour. Wow!!! Insane, right?? But SOOOO amazing. I ate one and sent the rest to work with my husband! Those look so insanely rich and decadent. And they have browned butter, which might be the best baking ingredient ever. YUM! Holy heck Ashton! What was that we were just texting about? Diet-schmiet. Geez louise and good goggles, girl! 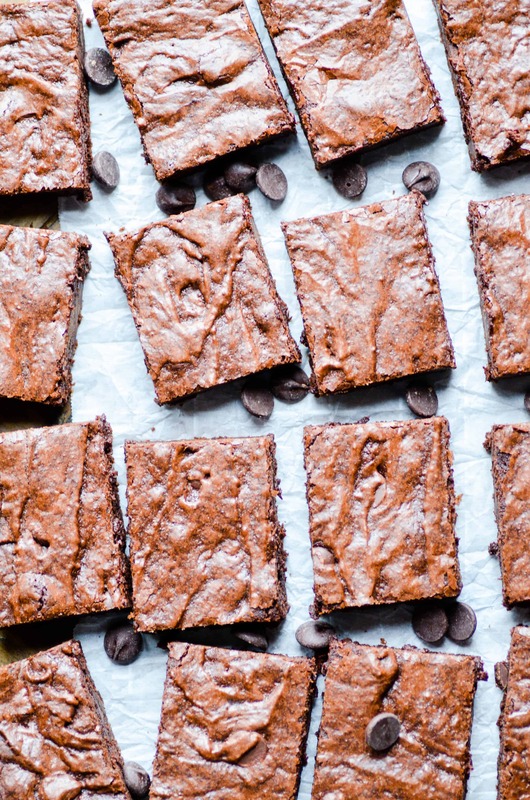 Brown butter in a brownie sounds like a fantastic idea; you must’ve been ahead of your time if you’ve been making these for a while. 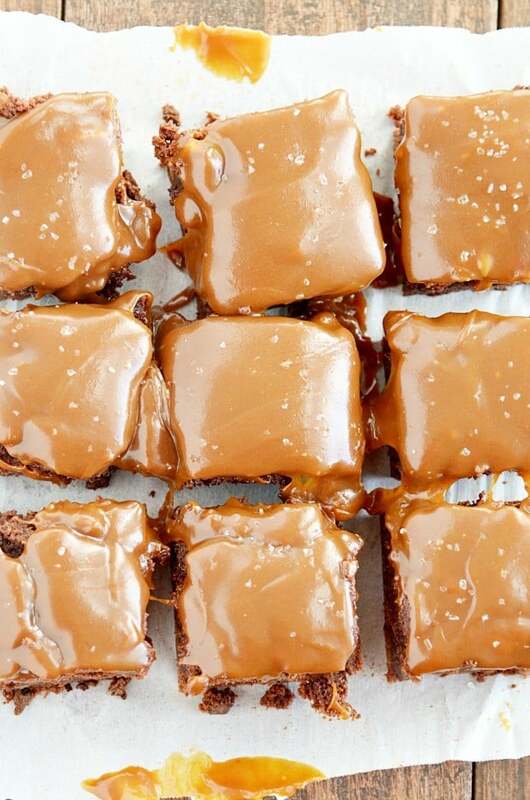 I can’t wait to use this base recipe for the Twix brownies I’m prepping to make–thank you for sharing! I need to have company over to try this out..I LOVE brownies way to much to have an entire pan alone with me. 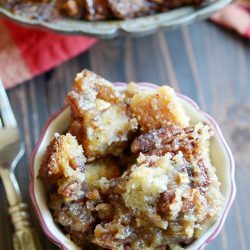 I love browned butter treats and this one looks fantastic! Love just about anything with brown butter. And I am a huge sucker for brownies, so these have my name all over them! These look like a recipe I have…minus the chocolate chunks, add a layer of browned butter buttercream and top with a layer of bittersweet chocolate. A million calories per bite, I’m sure, but ohmygoodness amazing! Oh man – those chooclate chunks are just calling to me. I was pretty sure I had mastered brownies and have the absolute best (I may be biased), but these absolutely deserve a shot. Will be pinning and trying soon! I made these tonight and they were so rich and creamy. I loved them! I hearby swear to never use brownie box mix EVER again! MU family loved them and I’m taking the rest to work tomorrow to share with my students and other teacher friends! Thanks! I added 1/2 a cup of milk chocolate and 1/2 a cup of white chocolate chips to these, along with the semi-sweet chips… um, these things are like crack. O My Gaawwwddd!!!!!!! These look absolutely amazing! My mom isn’t the biggest fan of chocolate but she loves brown butter cookies. Hmm I’m absolutely going to make these today! Furst question how many bars do you think this will make and are your sure its 2 1/2 sticks?? Can I use less than that?? thanks!!!!!!! I had made this today. When baking,the butter emit from the batter and became a layer of oil on top of the cake. I had pour and absorb the excess oil and continue to bake,yet it still emit. Yet, the Brownies still success. I had cut to try a bit,it looks moist yet not soft. Do you know why the butter emit from the cake? Hm… my only thought is that maybe you used a type of margarine or butter “spread” instead of real butter… Do you know exactly what you used? I am using this butter, http://anchorbutter.com/. The brownies still taste good. Will try again. do you have to cool down the melted butter before mixing other ingredients in? 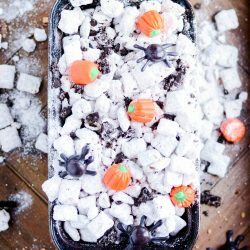 Any chance of getting this recipe in metric? Pretty please? Author, photographer, and dessert enthusiast. Making the world better one chocolate chip cookie at a time. ©2019 Something Swanky. All Rights Reserved.